I moved into my home a little over a year ago. The previous owners were so generous that they decided to leave a bunch of their old junk for us. (Gee thanks. )Well, there were 8 tires left behind. I was able to give 2 of them away. But for some reason I couldn't get rid of the rest. While reading through the no-dig site I had an epiphany. 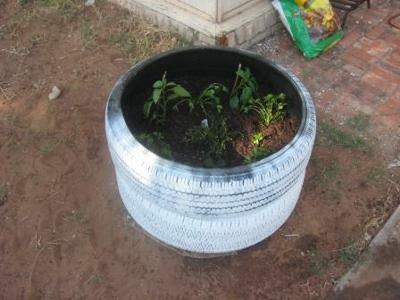 What if I made small raised gardens using the tires? I live in West Texas which is quite arid and very windy. Every time I've tried to grow anything it usually dies from lack of water or being beat to death by the wind. But by cutting out the side wall on one of the tires I could make a base to fill with my cardboard, paper, moss, and soil. Then I cut both sidewalls out of a second tire and placed it on top of the base. It acts as a shield against the wind yet still allows sunlight and water in. I used a drill to make a starter hole then used a jig saw to cut out the sidewalls. The whole thing took less than 30 minutes and made use of tires that may have ended up in a landfill otherwise. I have plans to make more of these "planters" and paint them all. I actually had a thought to wrap the exterior in "chicken wire" and create a stucco effect with some quikcrete. I'll keep you posted on how that one works. Take a look at the pic. I have also read that you can make a spud tower out of tires. Assemble the same way you did and plant spuds in the bottom. When the spuds come up cover them with your growing medium. When they come up again cover them again. Continue until the tower is full. They will set tubers at each layer of medium. Add more tires to make a taller tower if desired. When it's time to harvest just tip the tower over, pull the tires apart and pick up your spuds. Well! What can I say! First of all hats off! You have made something amazing out of a used tire! I love gardening and I would love to try this out since it takes only less than 30 minutes. These are worth their weight in gold. I use mine as mentioned before already. I use them to raise seedlings such as cantaloupes and other climbing things in. The inner rim is a handy thing as this when full of water keeps snail, slugs and most crawly things from climbing in to eat the young seedlings. Duckling & chicks can be raised in such places, safe from ferrets and stoats etc.